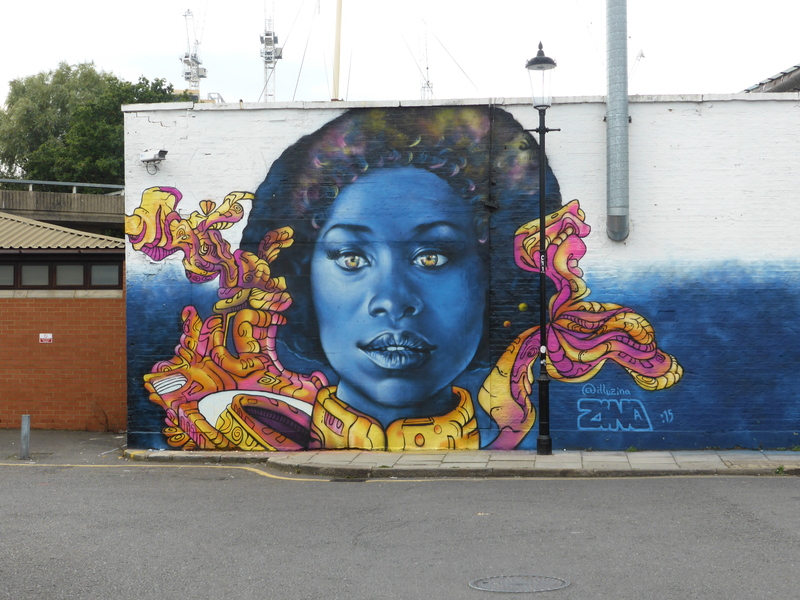 Last week in London, Street Artist Zina laid out her freshest work in W10, Shepherds Bush way, somewhat off of the beaten track for locating Street Art and adopted a fresh twist on her distinctive trademark blue-scale portraits. 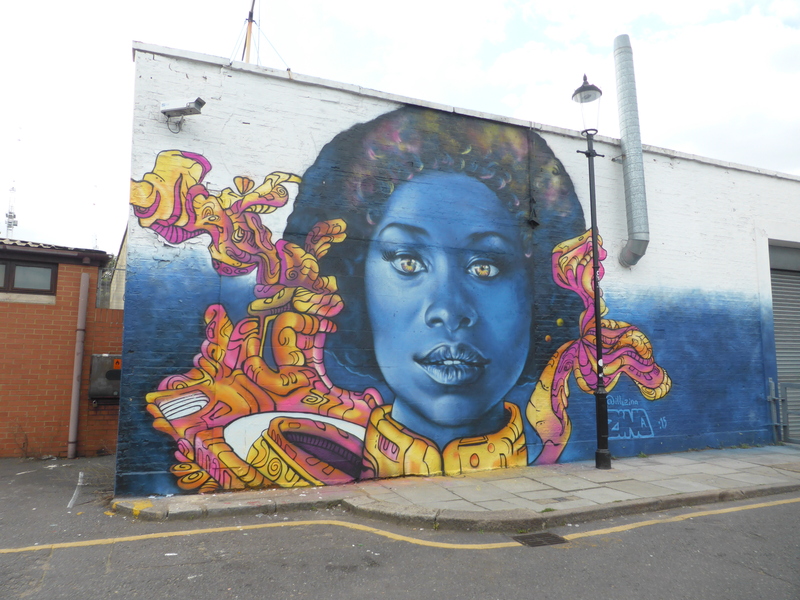 The work features a beautiful soulful female blue-scale portrait, with a cosmic tone about the hair and accompanied with a strikingly contrasting gold and purple collar that flows away from the neck and around the face, creating a somewhat abstract smoke enthused pattern. The bright gold and purple colours really standout alongside the deep blue hues of Zina’s work and really add a different perspective to Zina’s superb paintings. 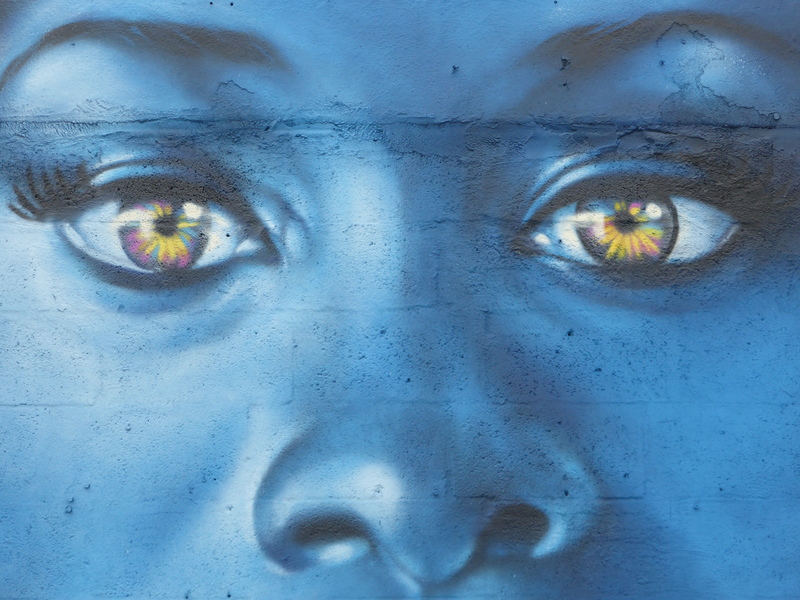 We love how the colours in the eyes when viewed up close match the brightness of the surrounding tones. 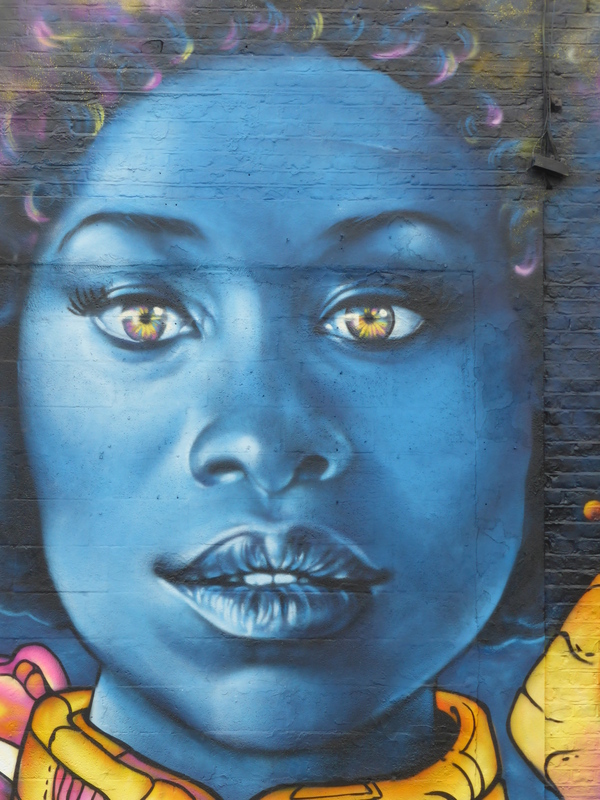 It’s always a pleasure to see work from Zina and was certainly worth the effort to go out of our way to see this fresh gem, which can be found in Crowthorne Road, behind the football pitches. 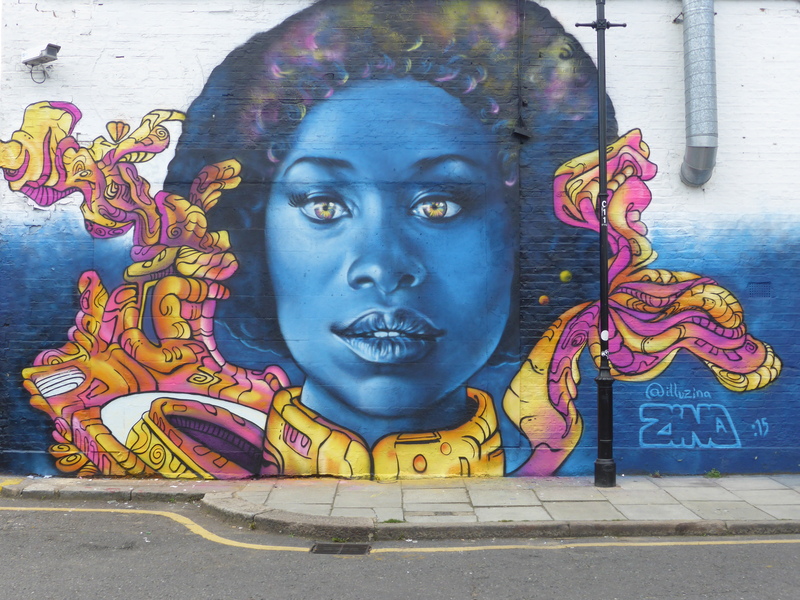 I do love the blue ladies Zina paints… As for the location I have been to loftus road to see QPR play many times in my younger days!!!! 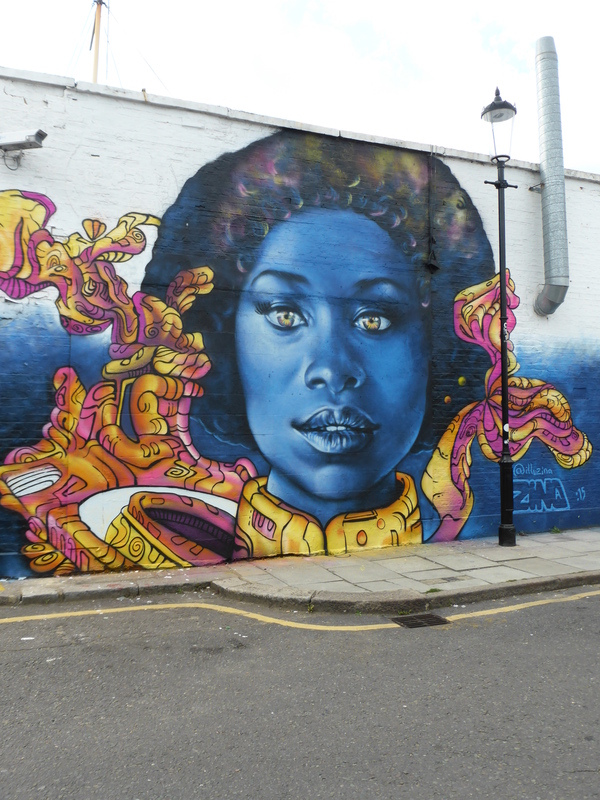 I think Zina has painted on a shutter in the Shepherds Bush market under the railway arches a few years ago. Is the market still there as I knew it was under threat of development?.. 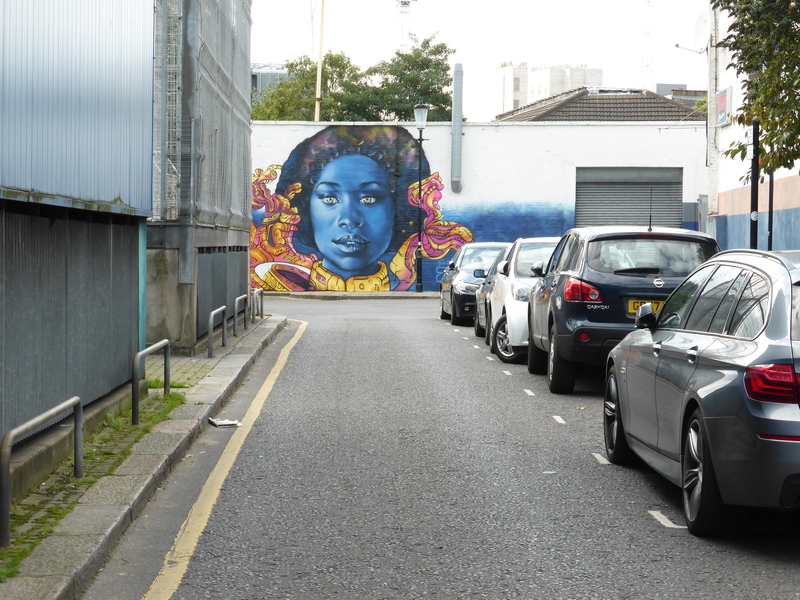 I really like the last snap with the lady looking down the street…. Very well taken! To be honest we have no idea about Shepherd’s Bush Market, have never visited however we wouldn’t be surprised to find it is under threat with the development of Westfield in recent years. Also we agree with you wholeheartedly Zina’s portraits are just wonderful, always a pleasure and worth the effort in this case of trekking across London for. Lastly thanks, we were proud of that last shot also, makes a pleasant change from being crammed right up against a piece in some alleyway. You might find the link below confirms my thoughts that the market has been sold to developers. Orion have paid £150 million to Transport for London to the developers. The local stall holders and shopkeepers thought hard over 4 years to stop this so called regeneration and with no plans for social housing, it’s looking very bleak for low income families and traders. Maybe you folks should best try to get down there and locate any street art still in the market and on the shutters before its too late! Thanks so much Mitch for bringing this our attention, this is the way London is going across the boroughs, progress should and needs to happen, but not continuously at the cost of loss of a sense of local community and identity, shame indeed. We will do our best to see what art we can find in the market, will be tough with the early nights drawing in though.